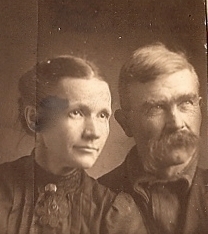 There may have been towns during Michigan’s lumbering era that had uglier reputations than Meredith, but I’ve not heard of any. 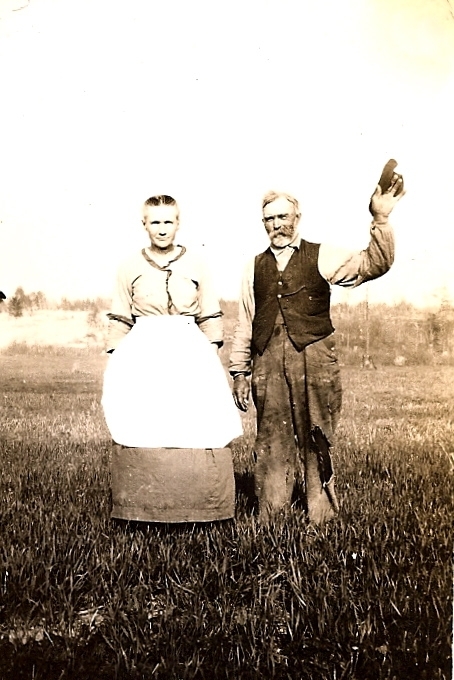 While the town in the northeast corner of Clare County was created to serve the thousands of lumberjacks who worked in nearby camps with essentials like food and clothing; it flourished by providing those men with booze and women. It’s hard given the town’s evil reputation that it was once called the “wonder of the north woods,” the “great city of the day” and “a marvel,” all these in an article in the Gladwin Record in March 1884. 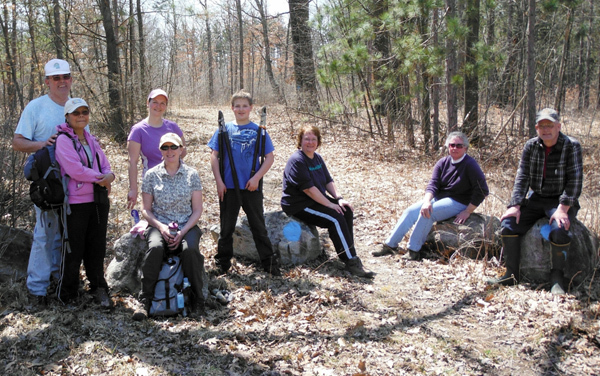 That’s when 18 visitors from Gladwin traveled into through what was then wilderness to visit the town. In company with a jolly party of 18 people (babies included) the editor of the Record visited the far famed city of the north, known as Meredith, this week. Starting from our thriving village, passing through the settled country containing flourishing farms etc, for about 4 miles north on the Midland and Houghton Lake state road, we are amidst the monarchs of the forest. 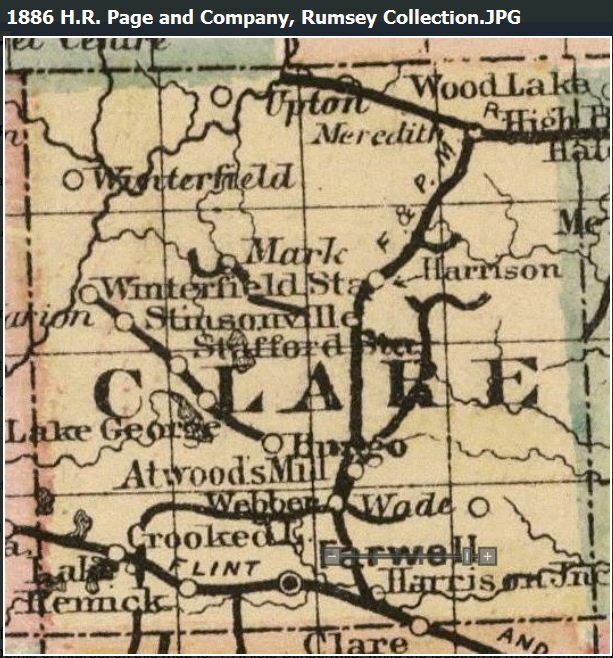 Eleven miles farther we go without passing even the cabin of a settler—all to relieve the monotony being the camps of Rust, Eaton & Co, about midway, where 40 men are employed and huge rollways of logs are seen on the north branch of the Cedar near by. The trees were crested with flakes of “beautiful snow” which rendered the scene exceedingly picturesque. The timber passed is pine, hemlock and hardwood, in some parts being intermingled and in others pine or hemlock towering majestically on either hand. There are excellent openings for saw and shingle mills and a tannery in this locality would find an excellent outlook. A large part of the way is what is known as “stripped lands,” the pine timber having been cut. Where visible the soil seemed to be a good rich clay, and from the variety of growing timber we judge that the thousands of acres of wilderness are capable of being made into beautiful farms, and are many years pass we predict that the axe of the settler will resound throughout the forest where now deer and other fierce residents thereof roam. This map shows the location of the Corrigan House and Meredith Depot. 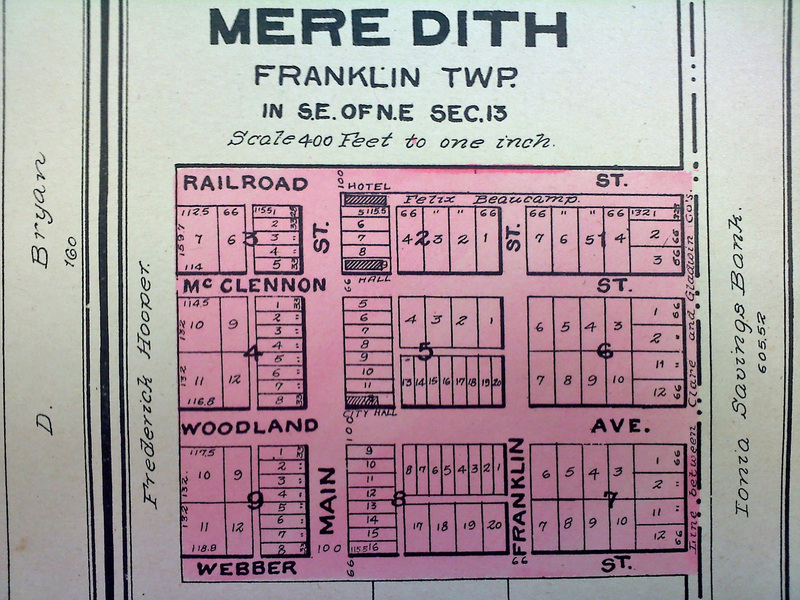 The depot would have been on the south side of Meredith Grade. The accuracy of the map is assumed but cannot be verified. The large and excellently equipped hotel recently opened to the public by Thomas J. McClennan of Bay City, the found of the town. The house is furnished in a _________ that would do credit to a good sized city of several thousand people. The house is 40 feet by 105 feet, 3-stories high. On the first floor is the sitting room, office, washes room, bar room, dining room and kitchen. The second story has an elegantly furnished ladies’ sitting room and in the two upper stories we find 14 single bed rooms and 11 double rooms, besides rooms for help. Arthur Meyer, late of Alma, has charge of the house, and to him we are indebted for courtesies extended in showing us through the apartments. He is the “right man in the right place.” Our party partook of dinner, served in a sumptuous manner, which we pronounced a No. 1. To enumerate(?) this bill of fare would be difficult. We counted upwards of 40 at dinner, besides a greatly number who partook afterwards. Mr. Mayer informed us that the hotel was doing a flourishing business steadily. Although it was Sunday, the bar was open and liquor flowed freely as water being partaken of by large numbers of wayfarers(?) who had gathered from the surrounding camps. However, all was quiet and we failed to notice an uncivil act. Besides the above, we notice quite a few dwellings and a number of buildings in the process of erection. The village is located on the line of Gladwin County on section 13, town 20 north, range 11 west, and is the terminus of the Saginaw and Clare County railroad. It is 15 miles northeast of Harrison and about 15 miles northwesterly of this place. The village was platted in December last by T. J. McClennan, of Bay City, who has a stand of pine nearby, where he now has 40 men at work cutting and skidding. A large lumber district surrounds the village and so long as the lumbering continues so does a lively business from this point. Considering the rapid growth of the place, it is a marvel. We trust that it might continue to thrive and we see nothing to hinder if steps are taken to secure the permanent development of the country surrounding, with the aid of manufacturing enterprises and settlers. The article turned out to be very wrong. By 1893, the town was in a fast decline. The lumber was all cut, Carr and Duncan were dead, and the railroad gone. In 1895, the post office closed and in 1896, a fire tore through the town destroying most of what remained. There is little visible from Meredith’s past that would indicate that it once had nearly 2,000 part-time and 500 full-time residents, and was a big enough town to have such things as a roundhouse for trains, a city hall, an opera house that seated 700 and a three-story school. 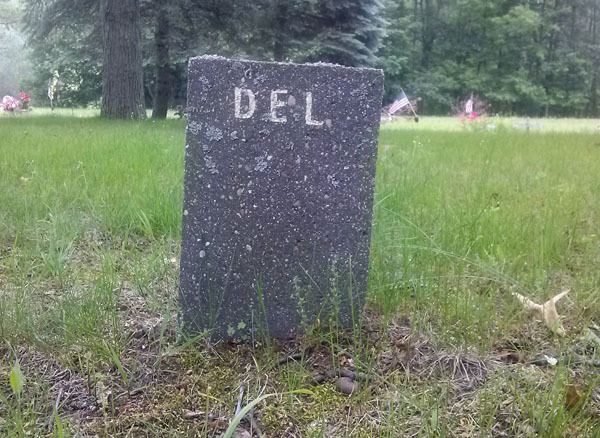 There are a couple of cemeteries, but they are on private property. The township hall was once an old church, and I’ve read that once the town burned, residents from other areas came to scavenge the bricks and rocks for their buildings. 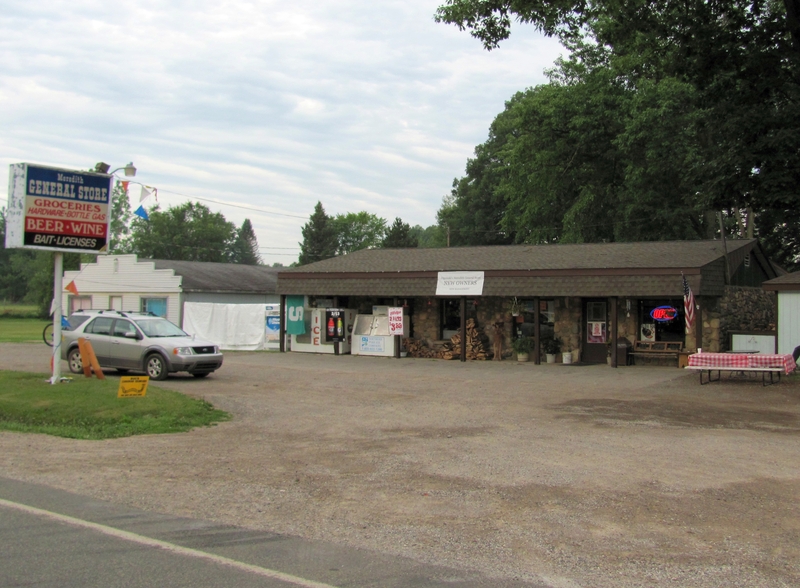 County store at corner of M-18 and Meredith Grade Rd. In 1938, four murals by Grand Rapids painter, mural painter, mosaicist, and educator Gerald Mast (1928-1972) were installed in the Clare, Michigan High School (now its middle school) auditorium, as part of the Works Project Administration art project. Each of the four panels that make up the mural are approximately 20-feet high and 8-feet wide. The panels were installed after being painted at the Detroit Institute of Arts, wrapped about stovepipe and transported by flatbed truck the 170-or-so odd miles to Clare. Dayton Spence, an art restoration specialist and historian of 19th, 20th and 21st century American art, came to Clare in 1988 to clean and restore the murals. Dr. Thomas Moline was superintendent of Clare Public Schools at that time and on Sept. 8, 2012, Dr. Moline returned to Clare from his home in Illinois to take part in a fundraiser and Depression-era art tour sponsored by the Clare County Arts Council. Standing in the auditorium with the murals to his right, Dr Moline gave those in attendance the keynote address–as well as a history lesson. Moving from the back of the auditorium to the front (left to right in the photos) the murals illustrate agriculture, peacetime activities, science & education and the emerging gas & oil industry. “Many WPA works of art chronicle the effects of the Great Depression upon the people living through those years. During that period there was great debate about the actual effects of a capitalist democracy. “There are two periods in the history of the United States that shook our nation’s foundation due to internal events. The most notable was our nations’ Civil War. The second was the Great Depression. “ An emerging middle class that was gaining momentum in the 1920’s was leveled during the Great Depression. A great tide of resentment rose up against government by a nation that felt they should have been far better protected. Resentment formed even faster against the ‘capitalists’ who were viewed as being financially capable of weathering the Depression. “As unemployment rose, as families lost homes, as individuals’ educations were squandered, a major debate took place within large cities and regions about the form and operation of government that would better serve and protect ‘the people.’ Variant forms of socialism and even communism were openly debated within a nation that was searching hard for answers to remedy economic and service delivery problems. In the 1930s, capitalism and the free market economy also became suspect for their perceived ability to make some rich while many laborers worked for subsistence wages. “Dayton Spence related that WPA artists purposely injected the look of disassociation in their subjects to generate a feeling of questioning within the viewer…There seems an expression of loss in the faces in the Mast Murals,…or maybe a sense of being let down. Or is it a sense of looking out of the present situation…to something…beyond? Arrangements can be made to view the murals during the school year by contacting the Clare Middle School at (989) 386-9979. Along with the Mast Murals, there is also another piece of WPA art on the school grounds, an 8-foot high statue called “Pioneer Mother,” by Samual Cashwan. It is deteriorating due to time and exposure to the elements, and in serious need of restoration. Unlike the Mast Murals, the statue has never been stabilized much less restored, Costs for work on the statue could run as high as $20,000. Even the Mast Murals should be attended to every 20 years. Doing the math, that means an expert in restoration should have been called in 2008 to examine them; however, because of lack of funding that did not occur–and there are no plans to work on them any time soon. Although heavy drapes were installed on auditorium windows at one time to slow the murals’ deterioration due to sunlight little else has been done to protect them. Clare also has two other depression-era works of art of note. One, a mural called “The Mail comes to Clare” is at the Clare post office and can be viewed during open hours. There is also a light-hearted mural that shows leprechauns making beer that covers approximately 70-feet of the wall in the restaurant of the Doherty Hotel. This mural can be viewed at any time. Note: The information in this post on the Mast Murals is based on Dr. Moline’s talk of Sept. 8, 2012. Following his talk, Dr. Moline generously passed along his address and I am endebted to him for doing so. I hope my changes did not materially alter what was a highly educational and entertaining address. I hope to post an unedited copy of his address soon. Photos by Marty Johnson. Close-ups of the Mast Murals come from postcards sold by the Clare County Arts Council. Membership is $10/year. If you would like to help preserve the murals of the statute of the Pioneer Mother or wish to contribute toward work on the Mast Murals, please contact the Arts Council at clarecountyartscouncil@hotmail.com. Tell them “Marty” sent you! It’s a mighty big bunny. Big enough to have a saddle and stirrups and big enough to hold most adults. But then this rabbit is associated with Spikehorn, a.k.a. John Meyers, Clare County, Michigan’s most famous (and eccentric resident) so it’s not surprising that this particular critter is not your usual run-of-the-mill rascally rabbit. 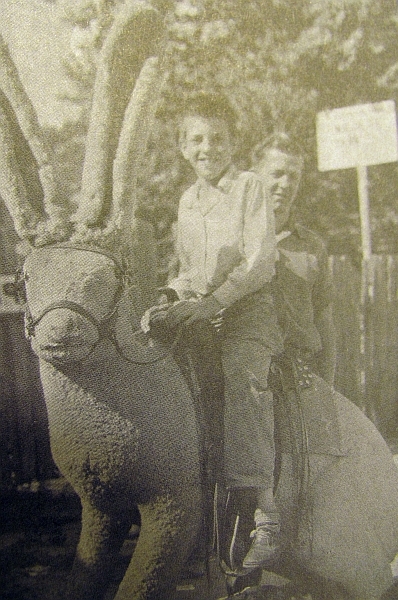 Every summer, from sometime in the 1950s to the early 70s the rabbit could be found in front of the Spikehorn place. Then it left Clare County until it was tracked down and purchased by Tom Sellers, author of the book, “Spikehorn, The Life Story of John E. Meyers.” The story of the rabbit’s recovery appeared in a story in the Clare County Cleaver in 2000 and appears at the end of this post. 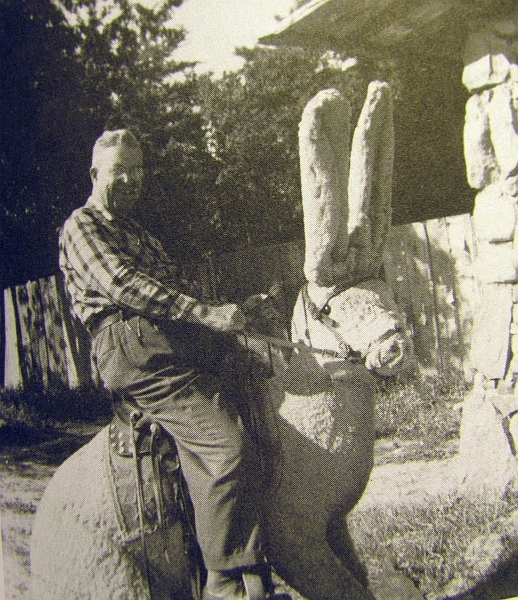 Earl Haslet astride his rabbit at Spikehorn’s Bear Den and Wildlife Park in Harrison in an undated photo taken from Seller’s book. sepia-toned pictures to tourists in the days before Polaroid photos and looooong before digital photographs and the Internet made sharing of photos instantaneous. The rabbit was once white but between sun and dust from the road and dirt from the kids, the rabbit eventually turned brown was dyed the latter color. Melvin Brewer son of Spikehorn Park manager Wayne Brewer on the Spikehorn rabbit. Junior Crane is in the back. Photo taken from Spikehorn book by Tom Sellers. Once Spikehorn’s place closed in the early 1970’s, Heslet packed up his bunny, hopped into his vehicle and out of town for good—until the rabbit’s recovery by Sellers. Now, the rabbit can be seen most Saturdays at the Clare County Museum at the corner of Dover and Eberhart Roads. This year, it even made a special guest appearance at the CCHS exhibit at the 2012 Clare County Fair. Maybe someday, the rabbit will be restored to its former glory and kids can once again have their photos taken astride it. Well, maybe not restored completely, even today a white rabbit won’t stay white for long. “He’s back. Back home in Clare County. The famous, fuzzy giant, saddled rabbit that for years welcomed visitors to Spikehorn’s Bear Den and Wildlife Park has finally returned. It seems the bunny has been quite popular since he left Harrison 30 years ago. He’s appeared in Vasser’s Centennial Parade, the Caro Pumpkin Festival and on the front lawn of a flea market 20 miles east of Saginaw, where he has wintered the manager’s garage. The rabbit was originally owned by photographer Earl Heslet, who made his living selling instant “While-U-Wait” sepia-toned pictures to tourists here and in Texas during the winter. He sold out, camera and all, shortly after Spikehorn’s Bear Den closed at the beginning of the season in 1970. Heslet’s wooden, black-hooded view camera is now a museum piece in Saginaw’s Castle Museum. 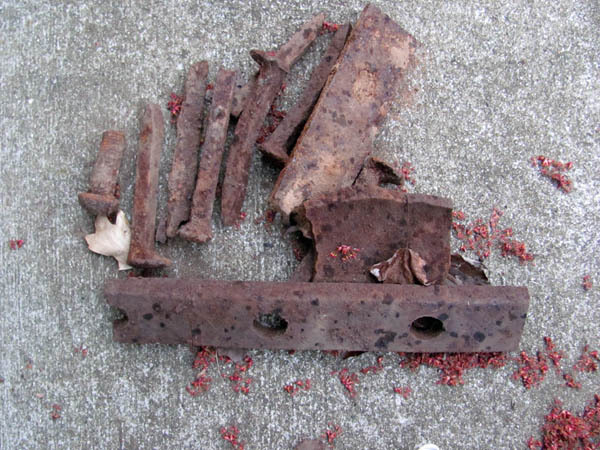 I’ve been out metal detecting the last week along some old logging railroad beds in Clare County and found a few railroad spikes, bolts and broken plates used to tie rails together. The objects were about 4 – 6 inches deep and were apparently left when the rails were torn up after the trees were logged and hauled away. Pulling up the rails and reusing the materials was a common practice from what I heard since saving money was important and leaving rails out in the middle of nowhere as a waste of it. From what I’ve read, Clare County may have the most old logging railroad beds in the state so there were a lot of rails to pull up and reuse. The large number of RR beds is not surprising considering it was the first logging railroad in the country when Winfield Scott Gerrish built a railroad into woods to help haul out the timber. Although the initial investment was high (around $300 a mile), it made it easier to get out the lumber. Gerrish’s fellow lumberman laughed at his venture when he first started but when they saw the huge return in his investment…well, they couldn’t build their own railroads fast enough. So although the tracks are gone the beds remain and underneath them are a few treasures. It’s interesting to hold in one’s hand a spike that was last handled by some unknown logger more than 125 years ago. It’s also interesting to take a walk in the woods and stumble on a bed out in the woods. They are quite common once one knows what to look for. While I am asking questions, I’d also be interested in finding out what the rules are about metal detecting on state land in Michigan. 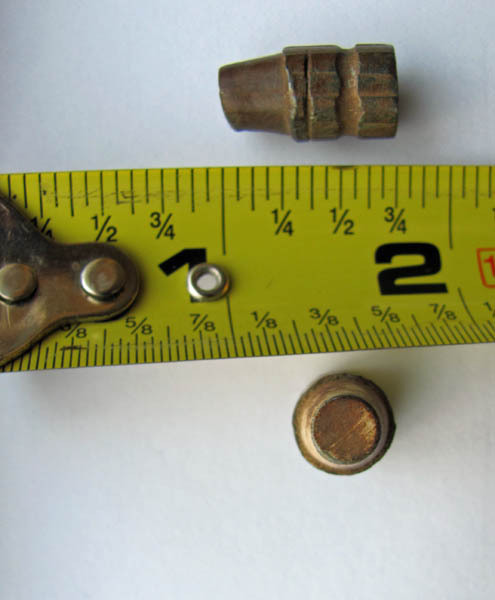 I found information on the DNR site about metal detecting in state parks but nothing so far about state land. While I know walking the rail beds is legal on state land I’m not sure about metal detecting, and want to know before I go. The remains of an old railroad bed from the 1870s on state land off Mostetler Rd. I went for a long walk a couple of weeks ago (before the winter snow) on state land, along a path that was once the bed of an old railroad track that ran from Hatton to Dodge City, a distance of about 11 miles. Hatton is now a ghost town and driver’s driving down Hatton Rd. 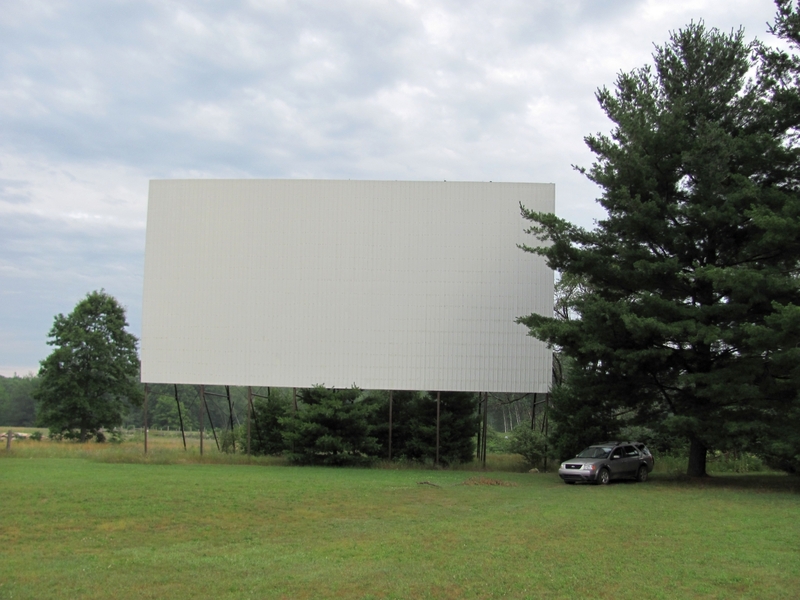 south of the town of Harrison, a small town in mid-Michigan Clare County will find little evidence it ever existed. Dodge, on the other hand is now a quiet community with cottages nestled around small lakes. There is little at either site to suggest they were once vibrant logging communities with post office, homes, businesses and more supporting the railroad and workers from nearby logging camps. This map shows many of the stops trains in Clare County would make. The PM-LH2 route shown in this map is not correct in this writer's opinion. 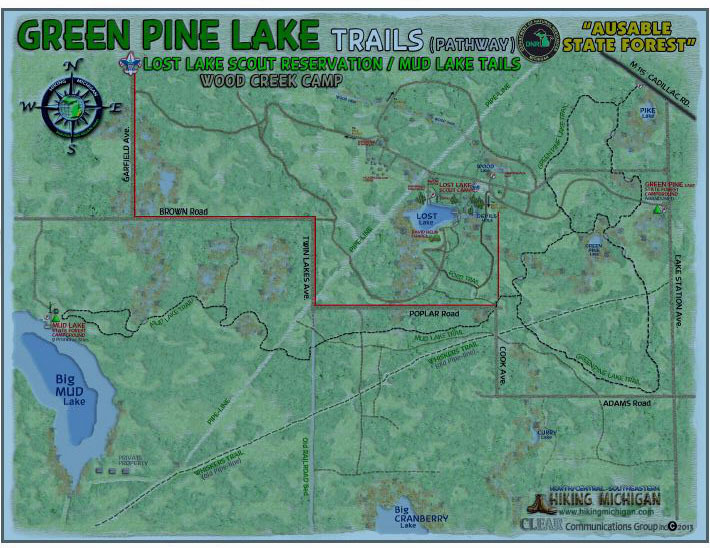 The track shown here did not go to the logging camp of Mostetler and then to Dodge. 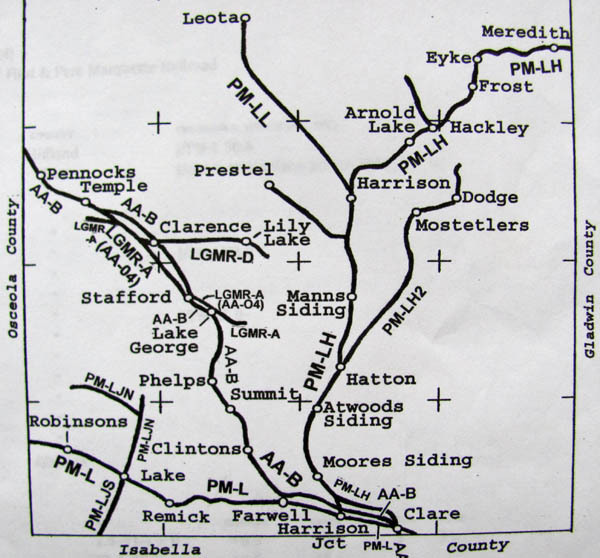 What is shown on the map is a railroad spur off that went to Mostetler. The main PM-LH2 track went in a relatively straight line from east of Hatton up to Dodge. The location of the bed I walked is off the south side of Mostetler Road (also called Mosteller) across from Michigan Moto Mania and located a couple of miles east of Harrison. Mostetler is an east-west gravel road that passes private and public land filled with scrub pines, oaks and cedar, and dotted with occasional homes. The road is named for a former logging camp/town Mosteller that existed for about five years in the 1870’s when this area’s massive white pines were cut and hauled south to build homes in growing cities like Detroit, Saginaw, Flint and even Chicago.None of the trees remain and even the stumps, some that measured nearly 5-feet across have decayed in the intervening years. 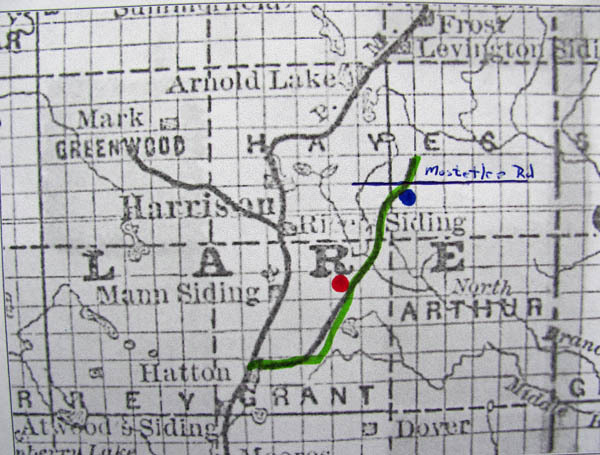 This spur of the Pere-Marquette railroad (marked in green )ran from near a former town called Hatton northeast to Dodge City a distance of approximately 11 miles. 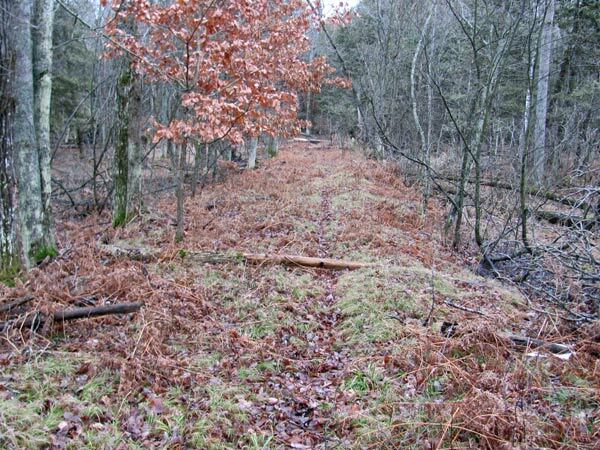 Stops were located along the way and a spur ran off of this track and ran north to the logging camp of Mostetler. The red dot is the location of Mid-Michigan Community College. The blue dot shows the location of the path this writer took. While the tracks, pilings and all evidence of the trains are gone, the bed is still relatively easy to find in most areas, especially in the fall and winter after the frost has killed the vegetation (not to mention the mosquitoes). Like all rail beds, this one runs straights and is relatively level since trains needed a grade in the order of 1 or 2 percent to safely haul the heavy logs. It is easy to see where workers raised the rail bed in areas or sunk it in others to keep the rail bed level. In many spots the railroad bed was built up to ensure a level path for the train but in a few areas the road bed was sunk down a few feet to provide a level grade. The walk I took headed south and I passed small creeks and downed trees. The walk also took me near to Mostetler Creek that begins in the Dodge City area, crosses Mostetler Road and then flows through state land before disappearing by the time it reaches M-61 to the south. 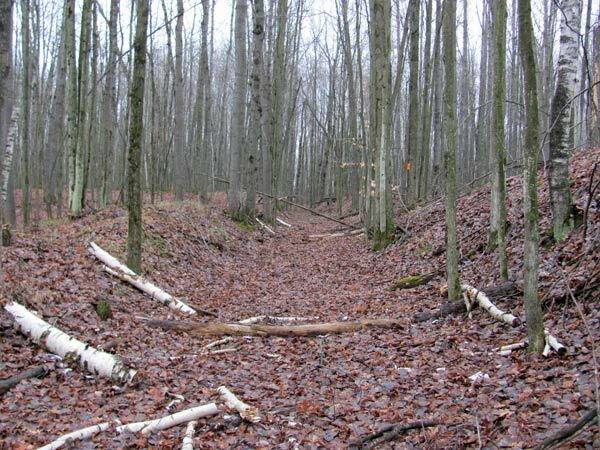 This site is popular with hunters in the fall since the roadbed makes for easy walking. At the same time, hikers may have a difficult time in the summer since the land near the road is swampy for the first couple of hundred years. However, once further in the woods, the land is dry and sandy and quite peaceful. If you want to see a railroad bed in Clare County, this is a nice one to see. And maybe if you stand still and close your eyes you might even hear a faint whistle of a train long gone.